This chapter provides an overview of the treatment of persons cleared by the police, etc., through the subsequent prosecution, trial, correction, and rehabilitation process (See Section 1, Chapter 2, Part 4 for juvenile cases). All cases cleared by the police, etc. are referred to public prosecutors, although with certain exceptions. The exceptions include any cases subject to disposition of trivial offenses (refers to cases in which judicial police officials need not refer minor cases predetermined by public prosecutors such as for theft, fraud, and embezzlement, etc. committed by adults to public prosecutors, in accordance with the proviso of Article 246 of the Code of Criminal Procedure) and Road Traffic Act violations for which non-penal fine has already been paid. 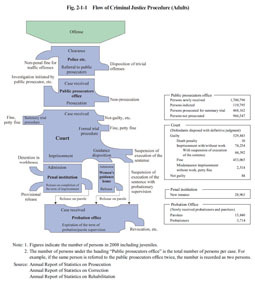 The number of persons disposed by the police as trivial offenses in 2008 was 114,228 (the number of persons disposed by the police as trivial offenses for non-traffic penal code offenses was 114,204, thus accounting for 33.6% of the total number of persons cleared) (Source: Criminal Statistics by National Police Agency). In addition to investigating the cases referred to above, public prosecutors can also initiate investigations themselves into cases that they have become aware of or about which they have received charges or complaints. After carrying out an investigation the public prosecutors can then decide whether to prosecute the cases or not, after having taken into account whether it actually is a crime, the need for punishment, etc. Prosecuted cases can be subject to either the ordinary trial procedure or summary trial procedure. Any offender found guilty in an ordinary trial can be sentenced to death penalty, imprisonment with or without work, fine, misdemeanor imprisonment without work, or petty fine. With a sentence of imprisonment with or without work for three years or less, or fine of 500,000 yen or less, execution of the sentence can, in light of the circumstances, be suspended for a fixed period of time. In such a case, however, the offender can be placed under probation during the suspended period. In addition, since October 2, 2006, clear and minor cases, excluding those pertaining to offenses punishable by death penalty, life imprisonment or imprisonment with or without work for at the minimum term of one year or more, can utilize the speedy trial procedure. When a court renders a judgment of imprisonment with or without work in a speedy trial procedure, suspension of execution of the sentence is rendered. Fig. 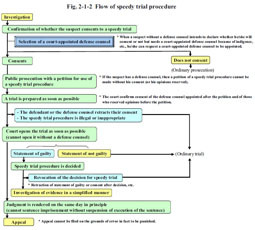 2-1-2 shows the flow of speedy trial procedure. In contrast to this, when subject to a summary trial procedure, the suspect will be sentenced to fine or petty fine of not more than one million yen by means of examination of written documents. If a conviction becomes final without suspension of execution of the sentence, the sentence is then executed under the instruction of the public prosecutors. Imprisonment with or without work and misdemeanor imprisonment without work are executed in prison or other types of penal institutions. Inmates are then provided with work, guidance on reformation, and guidance in school courses at penal institutions as correctional treatment to raise their motivation to be reformed/rehabilitated and develop the ability to adapt to society. Any offenders unable to pay fine or petty fine are detained in workhouses attached to penal institutions. Inmates are released on completion of their term of imprisonment. However, the Regional Parole Board can in some cases make a decision to release an inmate on parole before completion of his or her imprisonment term. Inmates released on parole are then placed under parole supervision during the uncompleted period of their imprisonment term (term of parole). Female offenders sentenced to a guidance disposition for an Anti-Prostitution Act violation are detained in women’s guidance homes. If granted parole by a Regional Parole Board they are then placed under parole supervision for the uncompleted period of their guidance disposition. Offenders placed under probation/parole supervision receive guidance, supervision, and rehabilitation assistance from probation officers at probation offices and volunteer probation officers (private volunteers).